Sesame Street has been teaching and entertaining children for over 41 years. Their philosphy is based on the idea that children learn best when watching television with an adult so that the adult can carry on the lessons when the show is over. Part of the series' long-term success is due to that fact that they are able to keep the adults entertained while the kids are learning. I grew up on Sesame Street and the main reason that my mom let me watch it so regularly was because she liked it too. Cleverly spoofing popular culture is one of the ways they are able to bring in the older viewer. In this DVD collection, they have compiled their favorites from over the years. 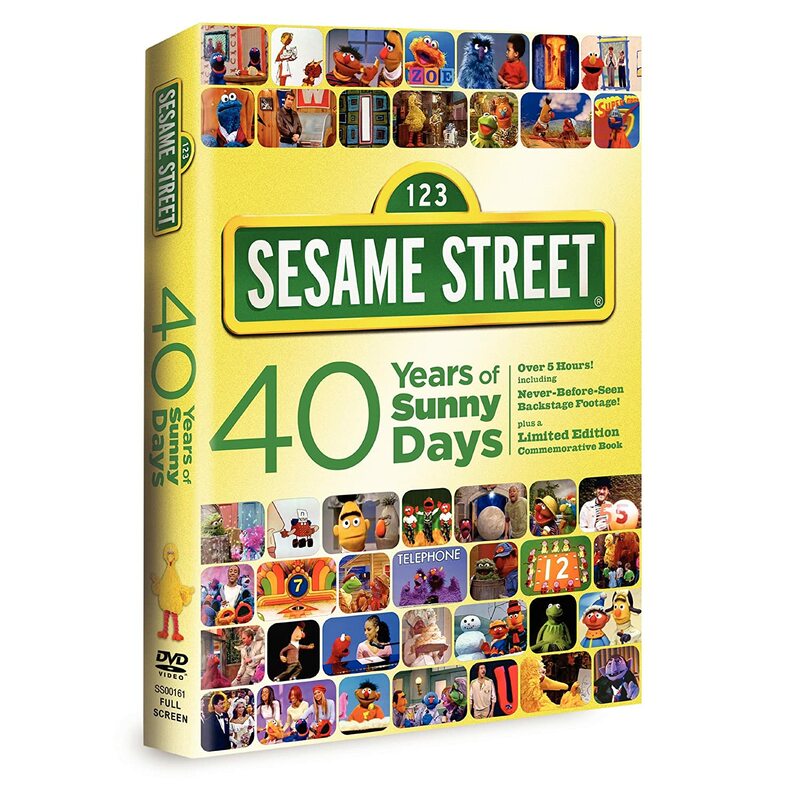 Volume 1 focuses on older favorites, all of which star Jim Henson's Muppets. Among the classic film spoofs, Kermit the Frog learns about subtraction in Gone with the Wind while The King & I finds Grover dancing with the titular letter. The television bits find reporter Kermit investigating the cost of the Six Dollar Man while Officers Grover, Ernie, et al of the Hill Street Twos learn how to group things into that number. Special Agent Cookie (Monster) investigates a town where all the birds, like David Finch, have Twin Beaks. Guest star Richard Dawson hosts Family Food, which teaches viewers what makes up a healthy meal. Popular music also doesn't escape from Sesame Street's creative team. Madonna's “Material Girl” is the basis for “Cereal Girl” about eating breakfast. Bruce Springsteen's “Born to Run” easily transforms into “Born to Add.” When a letter goes wild, he is dubbed “Rebel L” in reference to Billy Idol's “Rebel Yell.” The Bonus Special Feature presents three installments of game show Beat The Time, hosted by Guy Smiley and starring Grover, The Count, and Elmo, respectively. Volume 2 focuses on television spoofs and offers a few more guest stars but less of the more well-known Muppets. Dr. Phil joins a look-a-like Dr. Feel Muppet in a lesson on learning to get along, Anderson Cooper joins Walter Cranky and Dan Rather-Not to cover the letter G in the news while Oscar the Grouch is on special assignment at the dump. Mike Rowe, host of the Discovery Channel series “Dirty Jobs,” attempts Sesame Street's dirtiest job with the help of Oscar. Other spoofs include Law & Order: Special Letters Unit in a lesson about the letter M, A's Anatomy starring Grover trying to fix the letter A, and The Closer with an impressive Muppet impression of Kyra Sedgwick teaching the difference between open and closed. The Bonus Spoofs include the never-before-seen Jon and Kate Plus 8 from the Live and Learn Channel where The Count helps Muppet versions of the couple count all of their kids and the Internet hit Smell Like Monster with Grover paying homage to the Old Spice commercials. What the creative team at Sesame Street are able to do so well is have small touches that only adults would appreciate which doesn't substract from the overall goal of educating. While I enjoyed watching the collection of spoofs and laughed out loud a number of times, I don't know that I can recommend this to anyone that doesn't have young children to enjoy it with. I was hoping for more of the characters that I know such as Big Bird and Elmo. Most of the spoofs include Muppets designed to look like the real-life stars which does provide its own entertainment as they are usually spot on. Sesame Street definintely caters to younger children as the primary focus is counting and learning the alphabet; older children could be easily bored. I too watched Sesame Street as a very young tot but have no memory of the pop culture spoof aspects (as I was far too young to get that level at time of viewing). I absolutely love the examples that you provided from this set -- think that is so cool and savvy. In a sense I think there's a trend today to try to make films that both kids and adults can enjoy, which makes sense on entertainment and box office levels when pulled off correctly. Thinking Up, Wall-E, etc.